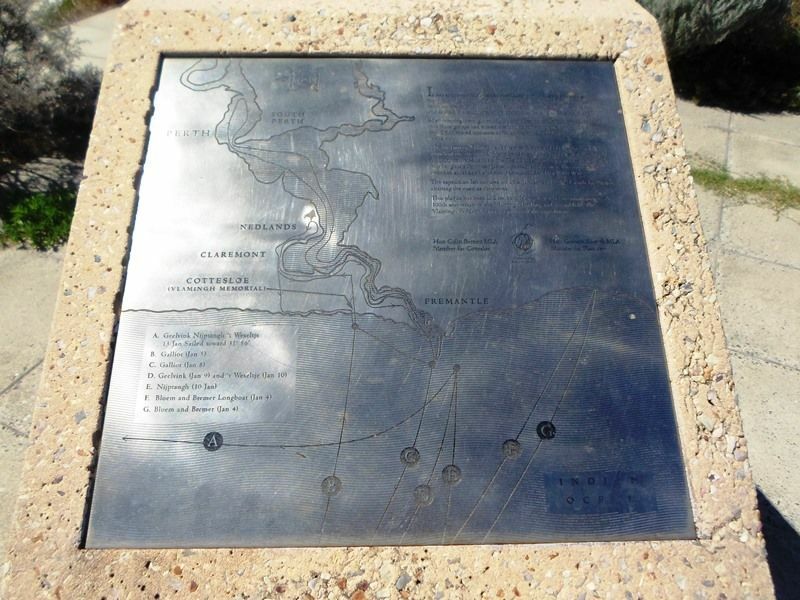 A plaque commemorates the 300th anniversary of the Vlamingh landing and the establishment of the Vlamingh Parklands. It was at or near this location that Dutchman William De Vlamingh, together with 85 crew of the ships "Geelvink", "Nijptangh" and "Weseltje" came ashore on 5th January, 1697 to become the first Europeans to visit and explore the south west of what was then known as "New Holland". On the 3rd May, 1696, the ships "Geelvinck" (crew 134) "Nijptangh" (50) and "Westeltje" (14) sailed from Amsterdam, Holland, under the command of Willem de Hessels Vlamingh to explore "The Great Southland"
On the 30th December, a party was landed on Rottnest Island for water and firewood. On Saturday the 5th Janauary, 1697, the "Westeltje" landed 86 officers and men on the beach in the vicinty of this memorial, exploring and naming the Sawn River.